Tom Phillips is an artist whose work is fuelled by several persistent preoccupations, expressed through an even larger number of formats. These include painting (both figurative and abstract), opera (composer, librettist, set designer), concrete poetry and ornamental forms of writing, sculpture and site-specific designs (mosaic, tapestry, wire frame objects). 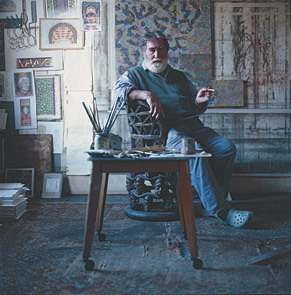 He has also taken on several para-artistic roles – critic, curator, committee chairman for the Royal Academy, translator – all of which he has folded back into his art. Born in 1937, Phillips attended drawing classes and lectures on Renaissance iconography alongside his studies at Oxford. Back in the South London neighbourhood where he has lived and worked nearly all his life, Phillips was taught by Frank Auerbach at Camberwell School of Art. Phillips's first one-man exhibition in London was in 1965 and he won a John Moores prize four years later. However, in the late 1960s he was possibly better known for his music activities (both classical and with Cornelius Cardew's Scratch Orchestra) including his own compositions, as performed by the pianist John Tilbury. In the course of Phillips's teaching career, at Ipswich, Bath and Wolverhampton art schools, he introduced Brian Eno, his best student, to the ideas that helped Eno develop ambient and generative music. In 1966 Phillips resolved to dedicate himself to making art out of the first secondhand book he could find for threepence on Peckham Rye. Thus began A Humument, longest of Phillips's extended serial projects. A Humument is a radical 'treatment' of a forgotten Victorian novel by means of collage, cut-up, ornament and other techniques. On the fiftieth anniversary of its inception, in 2016, Phillips completed the sixth and final version of this work – each version with successively more pages reworked, until his original work had itself been completely transformed. A Humument has become a touchstone of Phillips's oeuvre. The Royal Academy’s 2015 Summer Exhibition dedicated a full room to it. Quotations from A Humument populate his other paintings, works of art criticism, and some of the songs he wrote when returning to music in the 1990s. Irma, a central character and the muse of A Humument, gave her name to an opera – conceived in 1969, recorded in 1977 and 1988, with its full score published in 2015. A new production directed by Netia Jones will be premièred at the South London Gallery in September 2017. This variety of output is another Phillips hallmark. 20 sites n years, another series, consists of photographs taken during the same week, at the same time, since 1973, in 20 locations that describe a circle (about half a mile in radius) around his studio. Jake Auerbach’s documentary film on this ongoing project was released in 2016. Since the mid 1970s, Phillips has received many commissions for site-specific artworks and portraits, and these provide two further informal series that wind their way through his oeuvre. He has made tapestries for his old college in Oxford, sculpture for the Imperial War Museum, street mosaics for his native Peckham, and ornament and memorials for sacred spaces, including both Westminster Cathedral and Westminster Abbey. Phillips's portrait subjects have included Samuel Beckett as well as friends such as Iris Murdoch, Sir Harrison Birtwistle, Richard Morphet (keeper of the Tate modern collection until 1998) and the Monty Python team. In 1989, he became only the second artist to have a retrospective of his portraits at the National Portrait Gallery. Fifteen years later, at the same gallery, he curated an exhibition of his large collection of postcard photographic portraits from the early part of the last century, under the title We Are The People. This passion for collecting, classifying and curating also found expression in his book The Postcard Century, which portrays the history of each year from 1900-1999 through a collage of these vernacular images. Work on the postcard collection continues, most recently through the publication of a series of six themed selections, each curated by Phillips. Alongside his postcard interests, Phillips has been a keen student and collector of African art since his first visit to the continent in 1973. He curated a major exhibition, Africa: The Art of a Continent, for the Royal Academy and Guggenheim Museum in 1995. More recently he has published a book based around his personal collection of miniature Ghanaian gold sculptures. Phillips received the Frances Williams Memorial Prize in 1983 for his illustration and new translation of Dante's Inferno. He also made a TV version of the Inferno with Peter Greenaway which won them jointly as directors the Italia prize. Elected to the Royal Academy in 1984, Phillips went on to chair the Academy's Library and its Exhibition Committee from 1995 to 2007. He also served as a trustee for the National Portrait Gallery and British Museum. Phillips was made a Commander of the British Empire for services to the Arts in the 2002 Birthday Honours list. In 2005, he was appointed Slade Professor of Fine Art, at the University of Oxford, and between 2005 and 2011 he was invited as an annual Director's Visitor to the Institute for Advanced Study in Princeton. Now retired from committee work and portraiture, Phillips remains an occasional broadcaster and public speaker of wit and vision. His works are now taken care of in specialist collections across the world, including the Sackner Archive of Concrete and Visual Poetry (Miami), National Gallery of Australia (Canberra), the Ashmolean Museum, with an archive of his papers in the Bodleian Library (both Oxford). Tom Phillips is represented in London and New York by Flowers Gallery. For Tom Phillips's latest announcements and updates on current projects, please see the News and Studio Blog sections of this site.